In John Berendt's novel 'Midnight in the Garden of Good and Evil', the Christmas party thrown by the murderous antiques dealer Jim Williams is the event to go to, come the year's end. In Paris, this is our closest equivalent: an all-singing, all-soloing exclamation mark at the end of the jazz calendar. 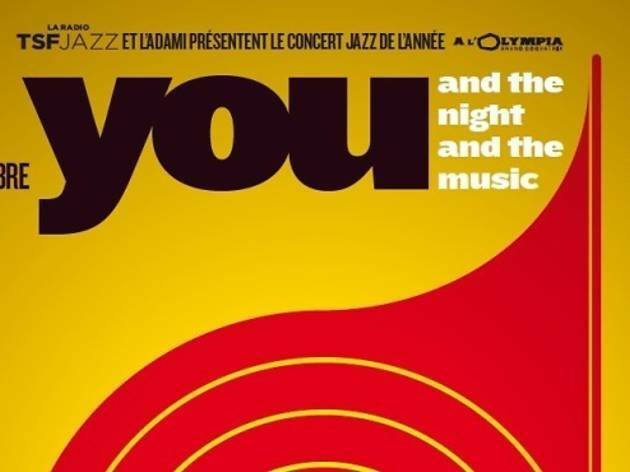 Curated by the TSF Jazz radio station and held at the Olympia, You and the Night and the Music is simple in concept: a dozen-odd representative jazz artists from 2013 perform a sort of retrospective of the year in music. The original contrivance – to have one artist represent each month – has been abandoned as the festival has grown; this year's edition boasts a 17-strong lineup, including a guest of honor and a couple of big bands to keep the music going between main acts. The whole is packaged as a kind of jazz Oscars, with the ever-reliable radio DJs Sébastien Vidal and Laure Albernhe on presenting duties. As with Jim Williams's parties, only the finest guests are invited: Gregory Porter, Tigran Hamasyan, Shai Maestro, Vincent Peirani, Jeff Ballard (Brad Mehldau's drummer) and others besides... And if there's only one stage to accommodate this brilliant lineup, then hats off to the backstage technicians, who seamlessly switch sets for each new performance. Finally, for those who still see jazz as the preserve of sneering rich boys in suits: rest assured that there's nothing elitist about You and the Music, which welcomes trainers and Lou Reed t-shirts like it would a blazer and a bow tie. This is jazz at its coolest and most appealing. For more information, full listings and ticket purchases, click here.